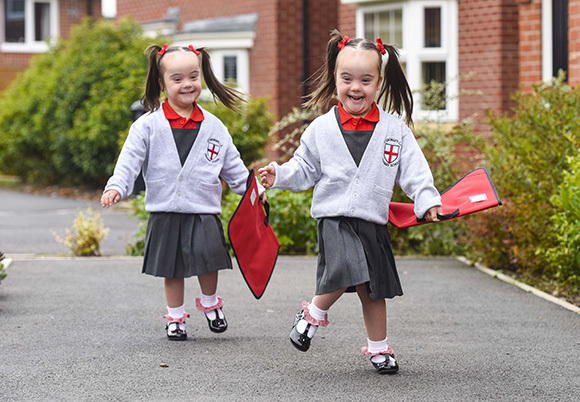 Identical twins born with Down’s syndrome at odds of two million to one have celebrated a milestone their parents thought they might never see. Happily, it looks like teachers telling them apart will be the biggest worry for Abigail and Isobel Parry on their first day of school. The adorable four-year-olds were diagnosed with Down’s syndrome three weeks after their premature birth in June 2011. Parents Matt and Jodi Parry admit they first thought this was “a life sentence” – but now devote their lives to busting myths and misconceptions around the genetic condition.